The Avalon School of Astrology is located in North Central Florida in Gainesville, USA. The school building consists of 1,800 square feet of building space in an attractive northwest area of Gainesville. The school consists of a classroom, library, computer room, instructor office, student lounge and student hall, administration office, and a small kitchen. 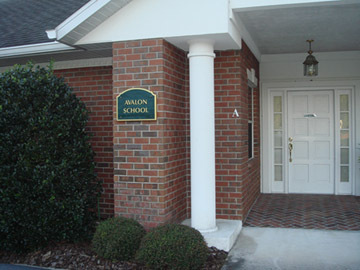 The Avalon School of Astrology is located in Gainesville, Florida. The school building consists of 1,800 square feet of building space in an attractive northwest area of Gainesville. The school consists of a classroom, library, computer room, instructor office, student lounge and student hall, administration office, and a small kitchen. Students have access to the library, student lounge, computer room, and the kitchen during school hours. The computer room is equipped with computers, printers, audio and video tapes and tape equipment. 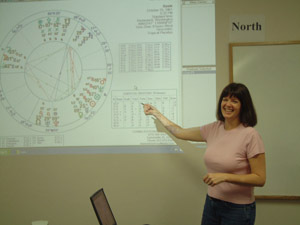 The classroom is equipped with a computer and LCD projector for the instructor to make presentations and assist in teaching computer software features and operations that students are required to master as part of their studies. The student lounge is a good place for students and faculty to discuss ideas, work on group assignments, and other activities that require some talking. Talking is not permitted in the library. The building and surroundings are pleasant, with trees, a small park, and woods nearby. There is a shopping area with grocery store, restaurant, etc. less than 1 mile (1 minute drive) from the school. Gainesville is located in north central Florida, a little over 2 hour drive north of Orlando and a little over 1 hour Southwest of Jacksonville. Saint Augustine is a little over 1 hour drive east of Gainesville. The population of Gainesville is about 100,000 people with a population in the surrounding area almost double that. The University of Florida and Santa Fe Community College are large employers, and there are also a good number of smaller technology firms (Medical Manager, Barr Systems, etc.) and various professional services. Because higher education is the main industry of Gainesville, there are excellent libraries and other educational facilities. There is a small airport in Gainesville with connections to Atlanta, Georgia, and Charlotte, North Carolina. Gainesville has a mixture of many ethnic groups and life styles. There is also a strong southern feeling that feels to many people more like Georgia than Florida. Gainesville is often called "the tree city" and is an attractive, well-maintained town. Summers are hot and humid with morning temperatures in the low 70's and mid afternoon temperatures in the low 90's. Winters are dry and cool with morning temperatures typically in the low 40's and highs in the mid 60's. Temperatures at night on occasion go down to the upper 20's in winter; this is not Miami or Fort Lauderdale! On the other hand, leave your heavy winter coats at home. Even in January temperatures will warm up in the afternoon to the 50's and sometimes higher. There are small theater and dance groups, local musicians, and concerts. There are also beautiful crystal clear springs within a half hour drive. There are small theater and dance groups, local musicians, and concerts. There are also beautiful crystal clear springs within a half hour drive. The beach is about 1 1/2 hour drive. Summers are hot and humid with morning temperatures in the low 70's and mid afternoon temperatures in the low 90's. Winters are dry and cool with morning temperatures typically in the low 40's and highs in the mid 60,'s. Temperatures at night on occasion go down to the upper 20's in winter; this is not Miami or Fort Lauderdale! On the other hand, leave your heavy winter coats at home. Even in January temperatures will warm up in the afternoon to the 50's and sometimes higher. via toward Gainesville heading East, about 3.7 miles. 4. 6212 NW 43RD ST is on the LEFT in Silver Leaf office complex. 2. Then take EXIT 390 (Left) to FL-222 E which is the same as NW 39TH AVE via toward Gainesville heading East, about 3.7 miles. * Gainesville, FL (GNV) closest airport, about 15 - 20 minutes to the Best Western Grand Hotel.